David Weir CBE is a British Paralympic wheelchair athlete. Declared as “the greatest wheelchair racer of all time”, he has an incredible record of six gold medals at the 2008 and 2012 Paralympic Games and eight London Marathon wins. David’s first Paralympic successes came in 2004 at the Athens Games, during which the athlete took home a Silver and Bronze in the 100m and 200m respectively. In 2006, he broke two World Records on the track and won three World titles in Assen at the World Championships. He went on to win two Gold medals at the 2008 Beijing Paralympics in both the 800m and 1500m. These were backed up with a Silver in the 400m and a Bronze in the 5000m. David won three Gold medals at the 2011 World Championships in New Zealand. London 2012 was the Games that changed David Weir’s status overnight. To add to David’s success in Beijing, David managed to capture four Gold Medals at his home Games. With victories on the track in the 800m, 1500m and 5000m in front of rapturous spectators, he finished his medal tally with a win in the Marathon. With his newly christened title of “The Weirwolf” by athletes and fans alike, his victories raised his global status to new levels. David carried the Great Britain flag at the 2012 closing ceremony, sharing the honour with cyclist Sarah Storey. In 2018 David a record eighth London Marathon. 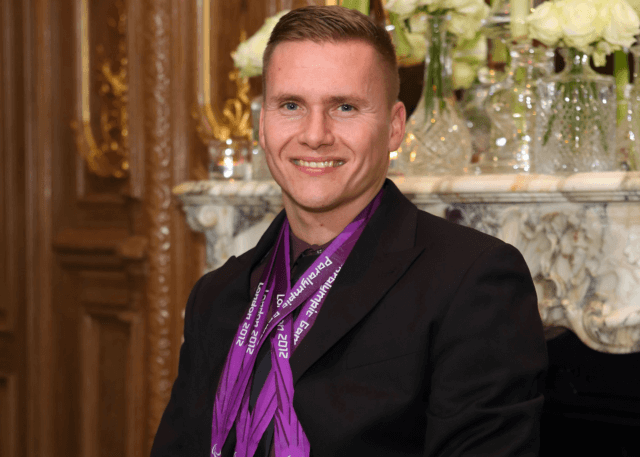 Passionate about building the profile of Paralympic sport, he has now set up an Academy with Jenny Archer MBE and continues to stand as a role model and influence for generations of younger athletes.